PLEASE DO NOT ENTER THE CHAT ROOM ONCE THE CIRCLE HAS BEEN STARTED!!!!!! This breaks the circle and also upsets the energy flow in our circle. Our Adept Maia will be leading the circle this month. I ask that you give her the same respect and curtesy that you would give me if I was leadIng the circle. This means no comments other than the ones asked for in the ritual. If you have ideas to add for or in addition to the ritual please share them after the circle is finished and social time has started again. We love to get new ideas but ask they be shared at the appropriate time. Thank you so much for following our simple circle guidelines. 1 green candle, whatever size you prefer. Maia: We call upon the Gods and Goddesses that protect the four quarters – east, south, west, and north. Please open your quarters and please hear our call. We call upon the Watchtowers that protect us using the four elements- air, fire, water and earth. Please lend us your energy and protect all inside and outside this circle and let harm come to none. We call upon the Goddess Selena to walk this circle with us three times round. To assist us with our work here tonight, please lend us your energy and power as you honour us with your presence. Everyone: Please share our first or Craft name plus state or country you live in. At this time carve one word into your candle of something you would like to be more prosperous in. You can be rich in many ways…money, love, happiness, etc. Envision what that looks like to you as you carve. You can use whatever alphabet you feel is right for you. You will have 2 minutes to do this. Everyone: Please type in DONE when you are finished. Light the candle and as you look into the flame envision again your prosperity.. See yourself enjoying what you’ve asked for. Insert your carved word into blank in this spell and recite it aloud three times. You will have about 2 to 3 minutes to do this. On this night and in this hour. With the Goddess’s help, my ________________ will grow. This spell will have worked wonders, as I will it this night. Everyone: Please type in “So mote it be” when you have finished. Allow the candle to burn for at least a short time as long as it is safe to do so. Each night light the candle and visualize your prosperity. You want it to burn as many days as possible, so judge how long you let it burn depending on the size of the candle. Maia: Thank you Goddess Selena for your presence here tonight and please return from where you came from. We dismiss the Gods and Goddesses that represent the four quarters, east, south, west, and north. Thank you for joining our circle and please return from where you came. the elements of air, fire, water, and earth. Thank you for your energy and protection, and please return from where you came from. The circle is open, but not broken. Be well until merry we meet again. If you have any questions about the ritual please email me at Ladybeltane@aol.com. Thank you. This full Moon we are again going to work on a goal to change one thing in our lives. Lady Beltane: To the Guardians of the East I call you into our Watchtower to protect us! Lady Beltane: To the Guardians of the South I call you into our Watchtowers to protect us. Lady Beltane: To the Guardians of the West I call you into our Watchtower to protect us! Lady Beltane: To the Guardians of the North I call you into out Watchtower to protect us. Lady Beltane: I cast this circle three times three with the help of The Triple Goddess and The Horned God. To take to a place that is not a place to a time that is not in time. To let us see beyond the 3-D plane will live upon. I ask the protection of the Maiden, Mother, Crone and Horned God for of us gathered here and for those of our brothers and sisters not able to join our circle tonight that nothing negative can touch us. That nothing we call upon can harm others! Lady Beltane: We come together in perfect love and perfect trust. Merry Meet Brothers, Sisters, and Honored Guest. 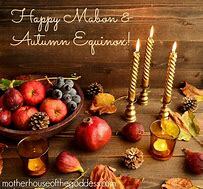 EVERYONE: Using your pen write down one goal you want to work on during this season of growth to come to fruition by the last of the harvest Sabbats (Samhain). When done fold your paper three times then engrave your candle with your goal. Light the candle than using it to start the paper burning. Please paper in the fireproof dish before it reaches your fingertips so as not to get burned. Burn candle for about a half-hour to an hour daily until it is burned all the way down. Then break it into small pieces and bury until all the while thinking of the goal you made it for. We will take 2 minutes for you to gaze into your candle and think about your goal and visualize it going out into the Universe to be heard by your guides, the gods and goddesses for them to help your goal come to fruition. After the ritual is over scatter the ashes in the wind. This again helps take your goal go out into the Universe to help it come to fruition. Burn the candle every day after the ritual for 1/2 to 1 hour until it burns completely down. While the candle burns see your goal as being completed. Then break up the remaining wax and bury it outside when your goal is complete. LADY BELTANE: Tonight we have a brother moving from being a novice to an adept in our coven. I have opened a small doorway and ask that all non-coven members leave us. We are honored you were here. Please leave knowing you are welcomed to join us for any Sabbat and/or Esbat gathering. Merry part until we merry meet again. Blessing from our coven goes with you. The doorway is sealed our circle is one again. William: Please type in – I now stand before our High Priestess and our Coven. Lady Beltane: Do to you take a vow to keep the identities of all here present a secret unto yourself? I dismiss the Guardian of the West with our love and thanks. I dismiss the Guardian of the South with our love and thanks. I dismiss the Guardian of the East with our love and thanks. I dismiss the Triple Goddess with our love and thanks. I dismiss the Horned God with our love and thanks. I bring us back into regular time and onto our place of existence. The circle is open but not broken. Go in peace and love. Merry part until we merry meet again. Blessed be dear brothers and sisters! If you will be attending out Coven’s New Moon ritual, there are some preparations you have to do before hand. Please have you candle prepared beforehand. If you choose to inscribe it the night of the gathering during that ritual there will be a two-minute window once the circle and Watchtowers have been called for meditation and raising as well as combining our energies. With our energies combined it will give the spell and your candle more power. The full ritual and any links you need will be up on Coven Life’s website by Thursday, May 18, 2017. If you have any questions please email Lady Beltane at ladybeltane@aol.com. 1 White Taper Candle (After engraving your candle freeze it. Take it out of your freezer and place in a candle holder that it can stay in somewhere in your home after gathering for at least two hours before our gathering begins to allow it to thaw at and to room temperature otherwise, it may explode possibly causing you or your home harm.) Do not place the candle in the microwave to defrost it will explode! Working candle magic is one of the easiest ways to work a long-term spell. A long-term spell includes any that take more times of doing it than once for you to get the out you desire from the spell. I will have a spell prepared to empower all our candles initially. Hecate I call upon you as I light this candle to release the goal inscribed. Help me reach my goal with all the power you hold. Bring the power and energy from the coven’s ritual forward with all its might. Do not let my intention you contain fold. Copyright 2017 Lady Beltane. This may not be reprinted in any way without express permission from the author. You can choose clothing, altar cloths, and candles in colors associated with the intent of your spell or ritual. You can write spells, incantations, talismans, and sigils using ink or colored pencils in colors corresponding to the magick you are working. When meditating, you can envision yourself surrounded by light in a color associated with your purpose. Every color has corresponding magical significance, each color possessing a unique vibration, attribute, symbolism, and influence.RED: Fire, strength, health, vigour, courage, energy, vibrancy, driving force Survival, will power, career goals, fast action, attracts and magnetises Lust, passion, sexual love, physical desire Danger, enemies, war. It is the color that represents the South quarter element of fire. Candles are widely used in Wicca and related forms of Paganism and Neopaganism, as they are in many other religions. Consecrated candles are frequently used on the altar to represent the presence of the God and Goddess, and in the four corners of a ritual circle to represent the presence of the four classical elements: Fire, Earth, Air and Water. Candles are burned at all ceremonies, and the lighting and extinguishing of candles often marks the opening and closing of the ritual. A candle can be consecrated and charged with magical energy by cleansing it and anointing it with a small amount of oil during the waxing phase of the moon. The candle can also be carved or painted with appropriate magical symbols to further empower the candles with those energies.